Native hybrid hazelnuts provide a crop that is consistently in short supply, well known by consumers, and nearly grow themselves. Tasty and healthy hazelnuts are used in many food products desired by consumers and are chronically in short supply. Almost all hazelnuts consumed in North America are sourced from either Oregon or Turkey. Yet, hazelnut trees are native to the eastern half North America from Louisiana to Georgia in the south, to Manitoba and Quebec in the north. The native hazelnut trees (Corylus americana) are hardy, disease resistant and are very tolerant of a wide range of growing conditions, and yet there is a shortage of nuts. The native nuts tend to be small and are not as tasty as the European hazelnuts (Corylus avellana) that that have been selected for quality for hundreds and thousands of years. This is where hybridization of the two hazelnut species for the past century has yielded new varieties that have the best qualities of both. Hazelnut organizations have formed to promote growing this native crop with improved qualities. Another wonderful thing about hazelnut trees is you don’t have to wait long before the tree will bear nuts for you to eat. Hazel trees start bearing in as little as 4 years and heavy yields in year six or seven. Also, you can choose to grow it as a bush or a single stem tree. A multi-stem bush will form if you don’t mow or cut down the shoots that grow near the base of the tree. In bush form it will grow 8 feet to 12 feet tall. In bush form, the hazelnut allows for easy hand picking of the nuts, and carefree environmental plantings for erosion control or as a hedge. If you choose to grow it as a single stem tree it will grow 14 feet to 16 feet tall and nearly as wide. Once the tree is big enough to shade the base, the shoots won’t grow. The native hazelnut tree is adaptable and easy to grow; but, it took many generations of hybridizing to generate native trees with large tasty nuts. 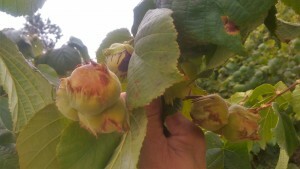 Hybrid hazel trees with jumbo grade sized nuts are successfully grown without pesticides or fungicides in USDA zones 4b/5a, in the Finger Lakes region of New York. The reason the European hazelnuts (a.k.a. filberts) were grown on the west coast was to keep the tasty European trees far away from the native trees that harbor a blight known as Eastern Filbert Blight (EFB) caused by the fungus Anisogramma anomala. Also, the tender European varieties tend to be less cold tolerant and are better suited for USDA zones 7/8. 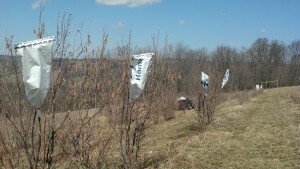 Hazel orchards in the Northwest are now slowly being decimated by EFB as the disease has spread throughout the region. Hybridization of native blight resistant hazel trees to the European hazel in North America has been documented since 1921 by Carl Weschcke. The Northern Nut Growers Association (NNGA) has been in existence for over 100 years. NNGA is a group of hobbyist and professionals that grow and breed nut trees. NNGA and similar associations such as Society of Ontario Nut Growers (SONG) have assisted with hazelnut improvement for over 94 years. In the past few years, more organizations have formed to promote hazelnut trees as a food crop throughout North America. Hazelnut production is expanding with the Ontario Hazelnut Association that formed just a few years ago to promote hazel orchards just north and west of the New York border. Ferrero, the makers of Nutella, is a $8.8 billion dollar company, that consumes 25% of the world’s crop, has a massive factory, just over the New York border, in Brantford Ontario Canada. There is Upper Midwest Hazelnut Development Initiative (UMHDI) to develop hazelnut cultivars and orchards in Wisconsin, Michigan and surrounding area. The Hybrid Hazelnut Consortium was formed to research and promote hybrid hazelnuts utilizing Rutgers University, Oregon State University, University of Nebraska–Lincoln and the Arbor Day foundation. Support to grow hazelnut trees has expanded greatly in the last few years as new hybrid trees come to market. From a financial standpoint, hazelnuts are an ideal specialty crop, as they are in continuous short supply and have high profit margins. Retail pricing for in-shell hazelnuts averages $6.00 a pound and shelled raw bulk hazelnuts are currently selling for $14.99 a pound in local grocery stores. The cost per pound of hazelnuts currently limits consumption. The future for increased hazelnut consumption is excellent, as Europeans consume up to eight times what an American consumes. How controlled pollination is done at a breeding orchard in Cortland, NY. New hybrids of trees are generated by controlled pollination. Pollen is first blocked from receptive flowers by Tyvek bags. Once the pollen shed is done the flowers are then hand pollinated from another quality tree. Hazelnuts provide a very profitable income well above what any annual grain crop can, after the necessary 6-year wait before the trees produce a significant amount of nuts. Assuming only 2000 pounds of nuts (up to 2800 lbs. should be attainable) at direct wholesale pricing of only $2.50 per pound (we currently sell for $3.50 per pound) amounts to $5000.00 per acre. In contrast, the average corn crop yields 160 bushels per acre in New York and at a current price of under $4.00 per bushel equals only $640 per acre. Hazels require similar annual input costs as corn, and organic sustainability should be readily achievable as the hazel tree is native unlike most annual crops grown. Hazel flowers are wind-pollinated, so no bees or butterflies are needed for pollination. Hazels have separate male flowers, called catkins, that form in late summer and shed pollen early in the spring before leaves emerge. Female flowers emerge from a bud and require pollen from a second tree, because its own pollen is self-incompatible. Therefore, two pollen compatible strains of hybrid trees are planted in an orchard. The majority of the cost to establish an orchard is in the first two years. First the field must be cleared of rocks, with pH adjusted to range from 6.5 to 7.0pH. Deer fencing for the orchard and individual tree protection is suggested. The animals find that the nut trees are tasty and the leaves, buds, and bark are readily consumed by deer, moles, voles, and mice. Protection is needed for the first three years until the tree is large enough to not be bothered by any animal. Young hazel trees need irrigation to ensure good survivability and growth, until the roots grow deep enough to not need irrigation thereafter. Hazelnuts offer a great opportunity for and any agricultural system from a backyard to a large farm. Different agricultural systems incorporating hazelnuts include: silvopasture, permaculture, agroforestry and woody agriculture. These systems utilize trees as an integral part of a sustainable agricultural practice. We believe this trend will continue to grow and lead both environmentally and economically over annual grain crops. can hazelnuts be grown in South Florida, Ft Myers area? How well do they produce in part shade as part of multi-tiered planting- like with apple trees? Do they produce well as trees and would they be less susceptible to browsing as a tree? what was the name of the non native that could fruit here? Hi Colin, take a look at one of these two websites as they might be able to answer some of your questions: https://www.growveg.com/guides/a-guide-to-growing-your-own-hazelnuts/ or https://www.arborday.org/trees/treeguide/TreeDetail.cfm?ItemID=847. If you still have questions after that, feel free to reach out to the authors of this article at Dawnz@znutty.com. Hope this helps! I am interested in raising hazelnuts and hazel nut trees,is this doable in southeastern manitoba? And who eventually buys the nuts? Who can I talk to that would mentor me thru this process? Hi Jed, thanks for reaching out! We unfortunately do not have a hazelnut specialist among our staff, but please feel free to contact the author of this article at dawnz@znutty.com with your questions. It also might be worth taking a look at the websites of the Northern Nut Growers Association https://nutgrowing.org/ and the Society of Ontario Nut Growers http://www.songonline.ca/nut_growing.htm. Hope this helps, and good luck! How well would hazelnut bushes produce in southeastern colorado zone 6a? Do you know of any hazelnut farms in the southern Appalachian (TN, KY, NC, VA) region? A quick internet search didn’t turn up anything for me. I’m just trying to establish if there is actually NO competition for this market in my area, where hazelnuts seem to grow great everywhere, including part shade and clay soil. It seems that hazelnut trees will produce in zones 4-9, and are hardy to zone 6 regions. If you have further questions, I recommend contacting the authors of this article, Dawn and Jeff, at Dawnz@znutty.com. Unfortunately we in the Cornell Small Farms office do not know of any hazelnut farms in the southern Appalachian, but perhaps the authors of this article, Dawn and Jeff, may know more. They can be reached at Dawnz@znutty.com. Yes, hazelnuts do grow in the S Appalachians. I have found several wild ones growing along the road where I live (west of Boone NC), and have planted 17 hazels from the Arbor Hazelnut Initiative. Some of the bushes haven’t produced much if any nuts (a couple are still too young), but I have harvested yearly from at least half of them. This year, I discovered 5 seedlings in other parts of my garden – probably buts buried by squirrels and forgotten. I have grown out seedlings from some of my good producing trees as well. Thank you for your comment, Cristof. Good luck with future hazelnut harvests. I’d recommend reaching out to the authors of the article with your identification question: Dawnz@znutty.com or their office phone: 607 756 4409. Good luck in identifying the tree! Can I grow hazelnut commercial in Ireland. There are hazelnut trees in the hedges but they don’t always nut. Also sometimes there is a nut but inside there is no fruit. Why do you think this is. or via their office phone: 607 756 4409. What strain of hazelnut would you recommended growing in Southern California, specifically Orange and Riverside County? In your article you mention “Hazel orchards in the Northwest are now slowly being decimated by EFB as the disease has spread throughout the region”, and I would like to plan against such a crisis. I would direct your question about hazlenut cultivars to Dawn and Jeff. They can be reached at Dawnz@znutty.com or by their office phone at 607 756 4409.